The celebration or worship of our daily use implements is the festival of Ayudhja Pujai. An integral part of the Navarathri festival, almost all the south Indian states celebrate this festival. All the daily use tools are cleaned and smeared with Sandalwood paste and vermillion, and the blessings of the gods are invoked to bring in prosperity on the work front! 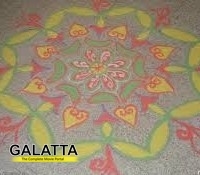 Galatta Media conveys its Ayudha Pujai wishes and hopes the coming year is one filled with prosperity for all of you!